Okay folks, you voted for it and here we go. Today we embark on the complete* reprinting of George Herriman's cartoons for the Los Angeles Examiner. The first cartoon, published 8/22/06, covers the Republican convention in Santa Cruz, where the Southern Pacific Railroad held their apparently customary role as string-pullers. You'll find a pretty good history of these events in California politics in this essay. 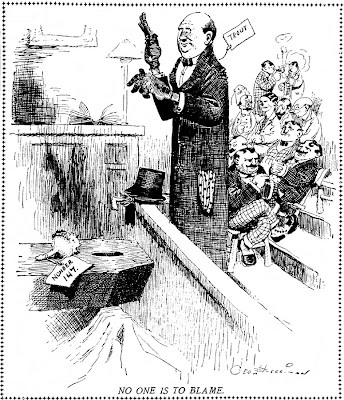 The second cartoon, published on September 1st, again shows Boss Parker, but I haven't a clue who Trout is or the significance of "number 147" in the coffin. 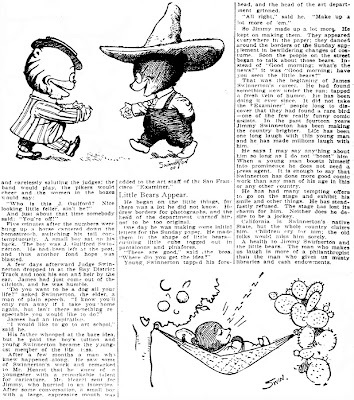 Herriman had not yet hit his stride in LA, with a gap of eight days between cartoons. It wouldn't be long before he was appearing in practically every day's paper. Stay 'tooned. I just can't seem to come up with a catchy title for this series. "Herriman Takes LA", "Herriman's Golden State Nuggets", "Saturday Afternoons with George" - all came to mind and rejected. Any suggestions? * Well, not quite complete. There were a few cartoons that resisted my photocopying efforts and just wouldn't turn out in good enough condition. I also didn't copy Herriman's occasional spot cartoons; they weren't particularly interesting and small cartoons are usually muddy on microfilm. Here is a short note oncerning the cartoon of Sept 1 (Trout). Dr J. H. Trout was Coroner (hence the garb) in LA; behind him Parker and Dunn (see my note on the first Herriman post). I would like to send you an email. Would you please send me your email address? Thanks so much for continuing to post analysis of the cartoons, even if I do feel pretty sheepish that it takes an Italian to teach us American history! And to Stephen, my email address is listed in the "About Me" section on the left side of the blog. Allan: Thanks for giving us more Herriman. Looking back at one of last week's cartoons in light of Alfredo Castelli's comments, the fish in the bowl on Dunn's lap is Coroner Trout. He says "The railroad is not to blame -- Purely an accident." The hat is a classic undertaker's model. Okay, I admit it, I'm a lazy so-and-so. 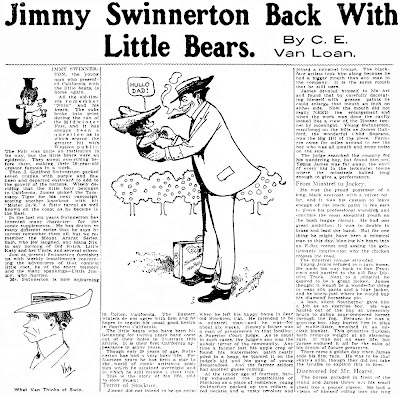 Ya see, I have this way cool article on Jimmy Swinnerton that ran in the LA Examiner on August 5, 1906. I was all set to OCR the text, scan the images, and generally reshape it into a delightfully pleasant blog post for you folks. But then my OCR software decided that the text of the article was written in Cyrillic or something. Admittedly the microfilm photocopy is not the crispest, cleanest image every, but gee whiz Wally. So, with the OCR doing its Mr. Magoo impression I had two choices. I could either laboriously re-type the article or just make you read the copy as it originally appeared. Guess which option this lazy lout took. By the way, this might be an opportune moment to discuss scan quality. I go to some considerable trouble to make sure that my scans, which start out on my computer as beautifully crisp 300-600 dpi images, reach you as crystal clear as I can make them on our crappy 72 dpi monitors. Unfortunately, the guys who run this whole blogosphere, Blogger/Google, see fit to occasionally monkey around with the images that I upload. The exact rules for when and what they will do are unknown to me so I don't know any tricks to get around them. And when Blogger decides to reduce the size or quality of the lovely images that I upload, they end up coming to you in *ahem* less than optimum condition. Just the other day, for instance, I uploaded those Once Upon A Time strips and they were in pretty nice shape. But when I look at them on the blog they're blurry and hard to read. As Dylan might put it, "it ain't me, babe". I bring this up today because the images for the article are on the large side, and my spidey-sense says that Blogger is going to have their way with them. So I apologize in advance for any squinting you have to do to get through the article. It's a dandy, though, and worth the trouble. Okay fine. Blogger must have heard me carping. The article images haven't been touched. The blame for any trouble you have reading the articles lands squarely on me this time. In addition to these rarities, Cole sent some more goodies. 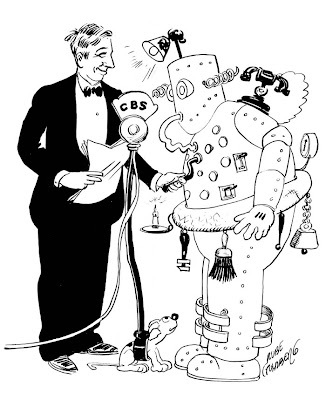 Here's a promo cartoon that Rube Goldberg did in connection with a CBS radio show he hosted. According to Cole it was a 15-minute twice a week program that ran on CBS starting December 3 1935. The robot was named Irving Q. Ironsides. Anyone know if the recordings of these programs still exist? 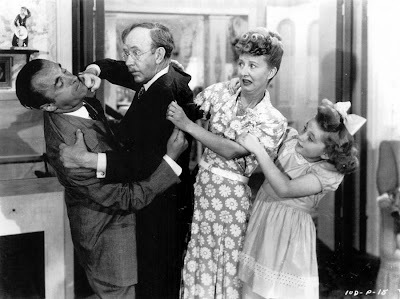 And here's a still from the 1946 film Li'l Iodine. Cole says that there are no known copies of this comic strip-based film still in existence. It starred Hobart Cavanaugh and Irene Ryan, with Jo Anne Marlowe as Iodine. The movie was produced by Buddy Rogers, husband of Mary Pickford. I hope it was funnier than the strip, which remains my nominee for the unfunniest (successful) comic strip of all time. Cole sent even more rare material, the rest of which I'm going to hold for a later date. Of course Cole earns a goodie box for his submission of the Happy Hunch photocopies, but choosing goodies for him is a real head-scratcher considering he has a stupendous collection. I solved the problem, though. Since Cole is a big fan of movies as well as comic strips, he'll be the recipient of one of the odder items in my collection - a huge, and I do mean HUGE, movie poster from one of the Bringing Up Father movies of the 1940s. Being a big Jiggs and Maggie fan I bought it years ago but then realized I have no place to display it in my home. All of which I mention not only to reinforce that my goodie boxes are worth the effort involved in getting them, but it brings me to a burning question: do any of the Bringing Up Father movies exist on video? I've never found them and I'd love to see one. 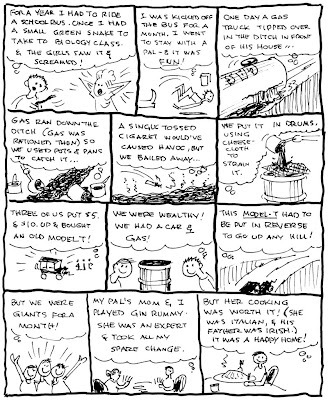 EDIT: Cole Johnson writes to tell me that this may well not be the first episode of Hickory Hanks - it's just an assumption I made based on reading the strip. Cole also reminds me that it's not "Li'l Iodine", it's "Little Iodine" - okay, Cole, but I still stick by its being the unfunniest successful humor strip of all time. Cole also says that he's seen really awful 10th-generation copies of Maggie and Jiggs on video, but none of a quality worth watching. Fairy tale strips have been tried many times, but seldom have they attained any great popularity. Once Upon a Time is no exception to the rule. Walter J. Enright penned this one that adapted classic fairy tales to the comic strip medium. The strip has a bit of a checkered history. Syndicated by McClure starting on June 1 1925, the strip in some papers went under the moniker of Make-A-Book, and in those cases included instructions for cutting out the strips to form a booklet (not exactly rocket science). The original run of the strip seems to have ended on August 5 1926, but McClure continued selling the strip in reprints as late as 1929. In 1933 Whitman Publishing issued a Big Little Book based on the strip even though McClure seems to have quit selling it four years earlier. W.J. Enright first pops up on my radar in the oughts, illustrating a few books, and then drops out of sight until the advent of this strip. By 1929, however, he was producing illustrations for the New York World and did a short-lived Sunday panel titled Here and Thereabouts. Then he disappears again. He, or perhaps more likely his progeny, pops up again in the 1950s as W.J. Pat Enright, when he has a few children's books published. Be sure to read the above samples, a complete tale with some rather 'Grimm' doings. Doctor Wertham would not be pleased! What a wonderful strip. I'd love to see more of it. I notice in the bottom of the final strip we see the name Hansely Gretel, as if the author was trying out a possibly punny pen name. Here was some concise storytelling I wish I could absorb in full. That's a notice for the next story, Hansel & Gretel. Enright's sig is a little further up in the panel. In the category of better late than never, I have him listed as: Walter Joseph Enright, 1879-1969. 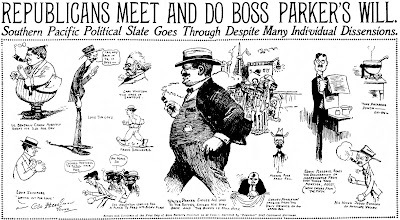 He worked as an editorial cartoonist in 1915. He published his cartoons until at least 1941. W.J. "Pat" Enright was a noted editorial cartoonist for the New York World and other newspapers. He did indeed write and illustrate his own books in the 1950s. His only progeny was his daughter (with Maginel Wright), Elizabeth Enright, who grew up to become an illustrator and a Newbury Award-winning author. Thanks to all of you for voting! First, my apologies for not posting yesterday. I'm training a new software tester and it's keeping me extra busy. And at night I'm busy watching those poor Ottawa Senators get the crap beaten out of them in the Stanley Cup playoffs. Tallying the web and email votes so far, the results are ~80% in favor of running all the material, ~20% for highlights, and one voter who wants both Herriman and stripper photos. Sorry buddy, you'll have to visit Craig Yoe's blog for that material! So it looks like we're going to post everything unless there's a real surge in votes going the other direction. Some of you have commented that the material should be published in book form. With the advent of lulu.com that has become a possibility, but I have to nix the idea for this particular project. I wouldn't be comfortable putting my name on a book of this material unless I was also going to do all the research on L.A. politics so that I could explain all the cartoons. Having taken years educating myself in turn of the century New York City politics I know what a huge project that can be, and I have to wimp out on you guys -- I'm just not willing to put in such a big effort for a book that could very well sell just a couple dozen copies. I've got my hands plenty full with Stripper's Guide research, not looking to add more to my plate. That being said, if there is some LA history expert out there who would like a collaboration I'm all ears. Despite wimping out on this particular project, I would like to put my two cents in that I am nevertheless a big supporter of annotating cartoons. I see a lot of reprint books coming out with material that really cries out for explanations. The typical reader cannot be expected to fully understand and appreciate the subject matter in early comics and cartoons, and I think publishers should consider having someone write annotations for the material. And I'm not just thinking about editorial cartoons. There are plenty of comic strip reprints that would benefit greatly from annotations. For instance, when I read reprint books of Gasoline Alley, Terry and the Pirates, Out Our Way and such, I can't help but wonder if the average reader goes away not understanding what's going on half the time. For those not immersed in the pop culture of the time, do they know what Walt Wallet means when he refers to a woman as a 'grass widow'? Or when Mutt is called a 'plunger'? Or Tillie refers to a fellow as a 'sheik'? I doubt that it would reduce the charm of these strips to be annotated when necessary, and it would certainly help readers to follow the nuances of the story better, making them more likely to be customers for more reprints. Yes, annotations are are really helpful, and often fun to read. As long as they are kept separate from the comic strips/pages. The most horrible example is the new translations of the Tintin albums here in Sweden, where they've placed the annotations on the bottom of the pages wich disturbs and interrupts the reading flow. BTW: The Gasoline Alley books you mention *have* annotations! Check in the back of the book. :) And Bill Blackbeards debaffler pages in the Krazy books are just great! Actually I was referring to the Spec Productions GA book. Haven't seen the new ones yet, probably will pass on them since I already have most of the run in clips. The Spec books were comped in return for some research that I did for them. I prefer annotations printed along with the strips, small enough that they can be ignored if you don't need them. actually, my new book "clean cartoonist's dirty drawings" WILL have some work by herriman fitting that title, both a previously published piece and an previously unpublished piece of art repro'd from the original. thanks for mentioning me in your great blog, alan. there's an incredible treasure every and every day on stripper's guide! My favorite recent wrong annotation was from one of Checker's Winsor McKay books - where they wonder if the "obvious fake name John Kendricks Bangs" was a McCay penname. Yow. Has Bangs ever been out of print? Yeah, those olden days CDs were really low capacity storage devices. Just two songs! Here's a pop culture icon that I've never been able to fully decode. In the 1880s and 90s it was common to indicate someone was a young dandy by showing him sucking on the end of his walking stick. What kind of weird iconography is that? Where did it come from? Hello, Allan---I've also seen the "dandy" character with the cane at his mouth many times when I go back to the 1890's. I call this guy a "Cholly" as that seems to be the name he's given most of the time. I read him as an English dandy, or a pretentious American aspiring to be one. I'm assuming the cane up to "Cholly"'s mouth was a gesture of pondering, like scratching your head. -----Cole Johnson. Don't forget to cast your vote on Saturday's poll regarding Herriman posts!